For over 7 years Jun Ming has been serving superb Chinese, Peking, Cantonese and Thai cuisine prepared in the traditional Chinese way. The regular clientele repeatedly take advantage of the sumptuous and very reasonably priced range of dishes on the a la carte menu or the fixed price “eat as much as you like” menu at only £15.45. 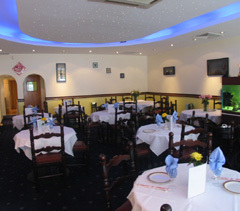 There is also a range of set menus and on Monday-Friday the three course Special Lunch menu at £4.50 is excellent value. Open Mon-Sat noon-2.30pm and 6pm-11.30pm (Fri-Sat to midnight), Sunday noon-11.30pm, Bank holidays 6pm-11.30pm. All major credit cards accepted.